Many researchers have been pinning workplace stress and overload on email communications. Some have put the blame on the vast number of incoming emails, others say that while the latter might have an influence, it’s heavily mediated by what is perceived to be effective or preferred email communication. Another factor seems to be how much emails interrupt the workflow. Does it sneak in a lot of new and unplanned tasks? Is it constantly calling for attention? Does it demand a lot of going back and forth to figure out what the other party is actually trying to say? Surprisingly, it has been found that that state that those that send more work-related emails during their free time are less stressed. Scholars speculate that it might be because those who already feel strained retrain from any after-hours engagement. Building a system with labels and folders. Setting a timeframe that reflects the level of urgency for answering the emails. Regulating the habits of checking, answering, and sending emails. However, that kind of training is more fighting the fire than preventing it. Sending and receiving maybe hundreds of emails a day often has a lot to do with how the work is managed in the organization. Even when your team is the world’s best when it comes to handling their emails, the mean number of hours spent checking the email in 2018 was 3. Three whole hours. Still seems a bit much, eh? A resource management tool that can be accessed by all of those that need to either plan resources or view their tasks creates transparency. Transparency reduces miscommunications. Once the software is implemented across the organization or the department, all the data is processed through one system. There’s no reason to send and ask for spreadsheets or collect information to draw up reports. Reporting can be done automatically. Thus, it’s possible to draw up regular and automatic project portfolio management reports that can automatically be sent to all the stakeholders. Although problems will still arise and face-to-face will always be the best way to solve problems even after implementing a resource planning software, transparent resource management will help you pinpoint those problems and then help you find solutions during a meeting. 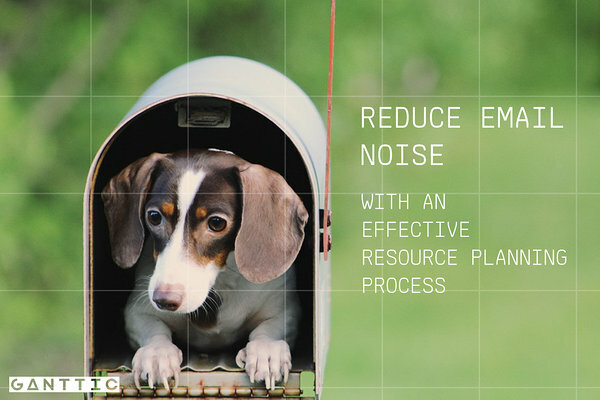 The simplest way to reduce the amount of confused, confirming or even angry emails, is to enable transparent resource management where every project manager can see how the resources are booked. With a shared resource pool, it’s easy to allocate the resources that are already booked or to overlook the priorities in the project portfolio. That’s where a resource management tool that allows you to add an unlimited number of users for free comes in handy. When all the resource and project managers can access the resource planning software and furthermore are actually using the same tool, it will create a sense of understanding of how the resources are allocated across the portfolio. This will diffuse the need to confirm and reconfirm the schedules made and compare the resource planning spreadsheets that each manager has drawn up. All the tasks will simply be scheduled with one software and every manager can have control over what’s going on. The transparency should not end with the managers. The good thing with tools that are easy-to-use and easy-to-understand, is that the whole team can be added to access the planner. That way they can see their own tasks, you can track their progress, and they can log the actual time spent on the tasks. If you are worried about overloading them with information, you can control what they see with user rights. And you can create custom views that you can appoint them to. That way they’ll see what’s relevant to them and won’t get lost in the details. Anyone who has ever implemented new collaboration software of any kind to the team might be shrugging their shoulders by now. All the training and explaining. Yep, it’s not going to be easy. But it will be worth it. When the basics of the resource management software are as easy as they are in Ganttic, the learning curve won’t be steep. You’ll just have to be convinced that you really need the tool and make your team believe that they do too. Reporting is an integral part of both project portfolio management and resource planning process. It's important to have an overview and analyze the portfolio as a whole, the pipeline of single projects, project status, resource utilization, and to forecast resource availability. Every single one of those reports needs constant updating and is meant for a different stakeholder. Constantly, you have to be drawing up yet another report and then send it out to whoever needs to see it in addition to you. Even though reporting is the key to improving resource management, calculating costs and getting a quantitative overview of what’s going on, there's a flip side. For many managers, it’s cumbersome. And – it adds yet another tag to your mailbox. From collecting the data to preparing the actual report, and then sending it out to whoever needs to see it, reporting adds noise to our lives, is repetitive, and takes away valuable time that could be spent on things that simply cannot be done by anyone else. Reporting, at most times, doesn't even need someone. It needs something. A resource planning software and a bit of automating. When you have implemented a resource management tool that is used by the whole team, you'll have all the data you need without any emails. It starts from the grassroots – the time tracking. The next step is project phases and statuses. Then – higher level resource coordination to ensure optimal utilization. If one tool is used to keep track of all that, you can easily select the necessary fields for the reports once, and then automate it. The reports will generate automatically whenever you choose them to. As an added bonus, you can send automatic reports to the upper management and other stakeholders. No more of those awkward emails where you have to start with an apology because you were late. Many scholars agree that while email communication might be quick and easy, face to face communication is still the best. Our customers have recommended others to manage their workflow with Ganttic as following: do daily scheduling and rescheduling when needed, have weekly resource planning meetings to discuss the plans with all the project managers and when necessary add the team in the mix. Endless email threads that we have all unfortunately been a part of, are often caused by miscommunication. It’s much harder to express your problems via email than it is while actually talking to each other. While for large organizations with hundreds of resources to plan it can be difficult to address each resource conflict face to face, having regular meetings where the schedules are discussed might be a solution. The frequency of those meeting, of course, depends on the granularity of your task management. If you are planning short tasks, more frequent meetings might be necessary because it’s likelier that conflicts will pop up here and there. If you are doing high-level resource planning with Ganttic, it’s likelier you’ll need less resource planning meetings. However, what’s important either way, is the regularity. Those kinds of meetings reduce the endless email threads only when conducted on a regular basis because it adds a sense of security for your team. They’ll know that the meeting will come no matter what and they’ll know when the meeting will come. Of course, even with regular meetings, we still urge you to have clear objectives and an agenda. That way you are on the road to have a productive meeting. And, I’d also like to remind you that even though we are surrounded by all the technology that enables visual or written communication, it’s still more than okay to call your colleague or just simply walk over to their office to ask why the hell did they reallocate the resource you had already allocated to your project.